Konflict Motorsports President Alex Martens & Cyclops Adventure Sports CEO Darryl VanNiewenhuise (Winner of the famous Stumpjumpers Desert 100 aboard his 950 Adventure) have had a long history or working/racing together over the years. This partnership grew out of two colleagues who often rode together and came up with the crazy idea to build a race team, "The Heavyweights" to compete at the 24 Hours of Starvation Ridge on 950/990 Adventures back in 2013 competing against teams on smaller dirt bikes as a source to test our products and services. That year we placed 17th overall out of 111 teams, 2nd in class, See video below. Since then we have competed/won our class in that event three years running. 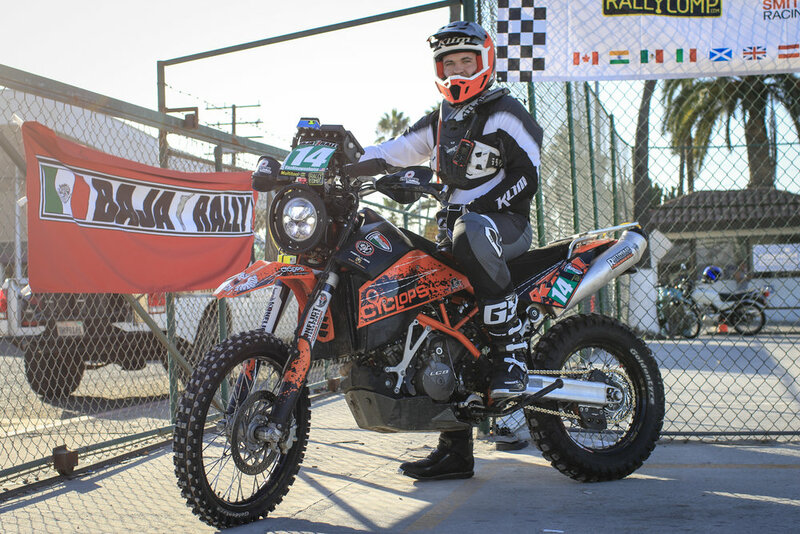 We received a phone call one weekend evening a few months back with Darryl pitching the idea of having his son (Wes VanNiewenhuise) race the 2017 Baja Rally aboard the Cyclops Adventure Sports KTM 950 Super Enduro in the Adventure Class! Alex Martens has been at three of the last four Baja Rally's, and at Sonora Rally with Rally Management Services/ICO Racing supporting notable riders such as Andrew Short (Factory Husqvarna Rally team rider) Dakar Finisher Scott Bright/Ian Blythe (Top Ten Stage Finisher 2016 Dakar), Dakar Malle Moto 2nd place finisher Lyndon Poskitt, Yuji Shinohara (HPN Reinforcement Japan), Trent Burgiss (2nd Overall at 2017 Baja Rally) and many others. As we have spent some time with Wes (he has been a crucial part of our success at two of the three years at 24 Hours of Starvation Ridge) and new his riding abilities were legit we jumped at this opportunity to become part of this project! Konflict Motorsports: Forks- KM3 Fork Revalve with Konflict High Flow Piston's, Micro-polish on lower stanchions, 6.6 n/mm 43.2x457mm fork springs, SKF Dust/Oil Seals. Shock- KM3 Revalve on Touratech Extreme with custom shock piston, larger bump rubber, custom hi/low speed compression adjuster internals, vacuum port threads peaned, plug loctited, and safety wired (these units have a tendency to blow the stainless steel plug out under extreme use). Rottweiler Performance- Enduro-cell Auxiliary fuel cell, Intake System, SAS Removal kit, 2into1 exhaust mid pipe with Yoshimura exhaust muffler. As you can tell from the build list above, the build of this bikes main focus was functionality without any added bling. Trying to keep the bike as light as possible, with enough fuel to make it to each days bivouac.